In the middle of May I searched for a place to go in August when the Rogue Valley of South Oregon gets enveloped in toxic wildfire smoke. 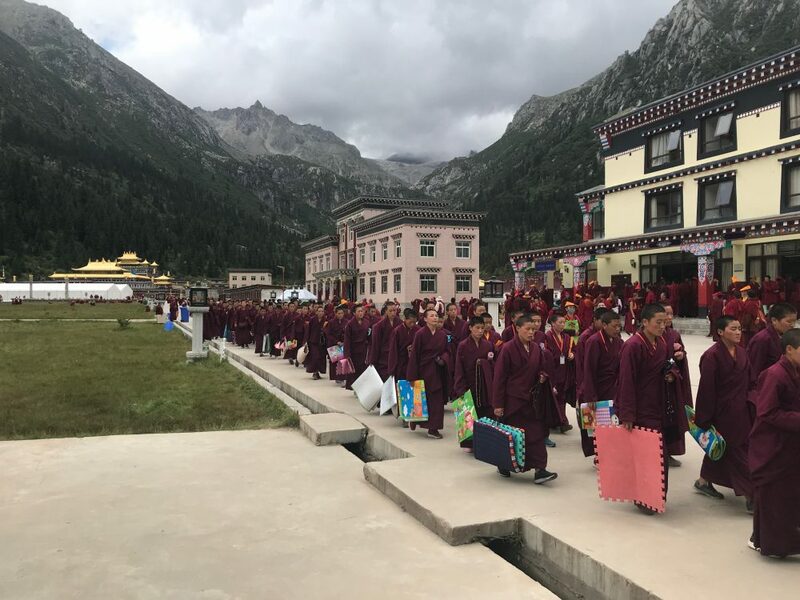 A link from Kunselling in Wales directed me to Shang Shung Institute, London, where Jamyang Oliphant of Insight Travels was offering a three-week pilgrimage to East Tibet/Kham in August. In a flash, I knew I had to go. To visit the land where our master Chögyal Namkhai Norbu was born and raised, to experience directly the many outstanding monasteries and places connected with our lineage of renowned masters and tertons(all the while revitalizing my memories of rich and fascinating stories Rinpoche has told over the years) became an imperative. Having applied practices from these masters for the past thirty years, I already felt deeply connected. Our meeting point was Chengdu, capital of Sichuan province. 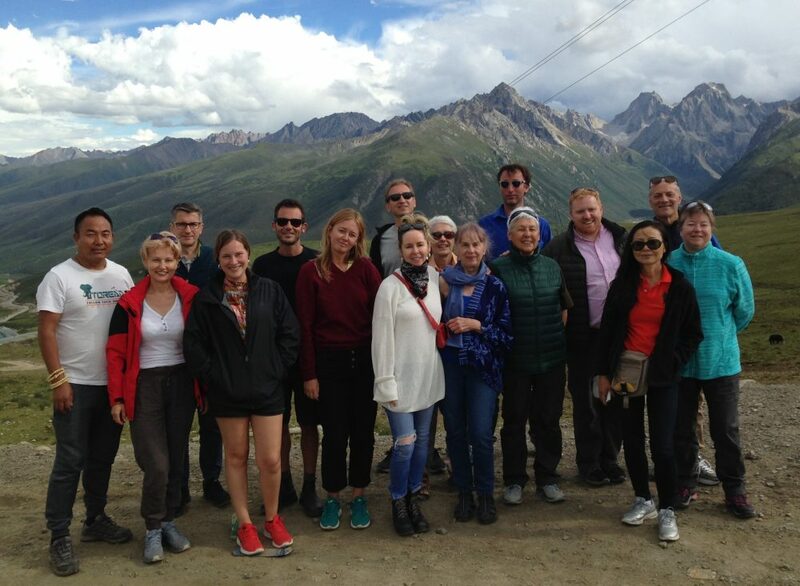 After lengthy flights from Europe, Russia, UK and America, nineteen people formed our group along with an intrepid Chinese driver and indefatigable Tibetan guide, Lobsang. I felt blessed that my daughter Leah could accompany me. After visiting some sites in the sweltering heat and humidity of Chengdu, we were anxious to get on our way. It soon became apparent that the Chinese are feverishly constructing new roads, tunnels, and super highways that will by-pass much of the traditional landscapes. Big hotels and apartment complexes are also a common site in many of the towns. Cement mixers, heavy construction vehicles and large transport trucks became a daily sight. 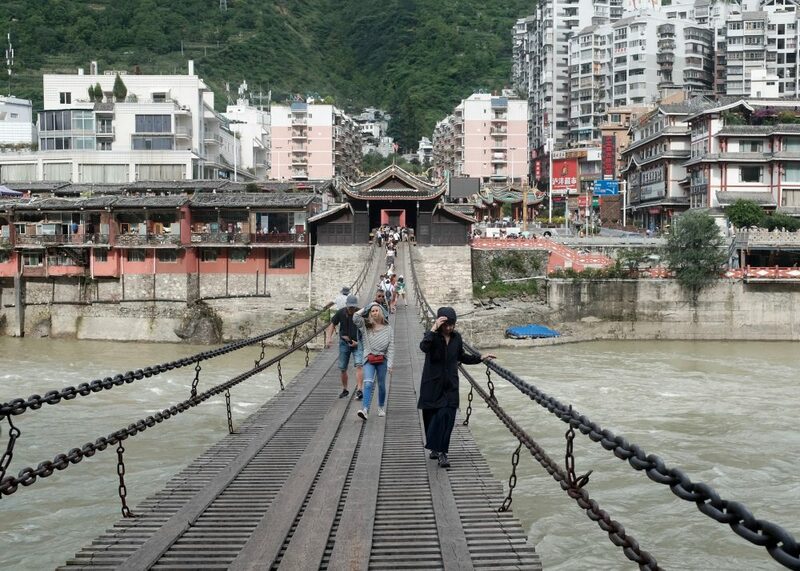 In Luding/Chaksamka we walked above the roaring Gyarong River on a famous iron suspension bridge reputedly built by the Mahasiddha Thangtong Gyalpo. His influence on Tibetan culture is unparalleled. Often called the “Leonardo of Tibet”, in addition to his artistic and engineering contributions, he was a great practitioner who tamed negative forces and constructed stupasand temples on sacred points throughout Tibet (and Bhutan). These sensitive “acupuncture points” connect and harmonize the whole of Tibet along energy lines. This is truly palpable. 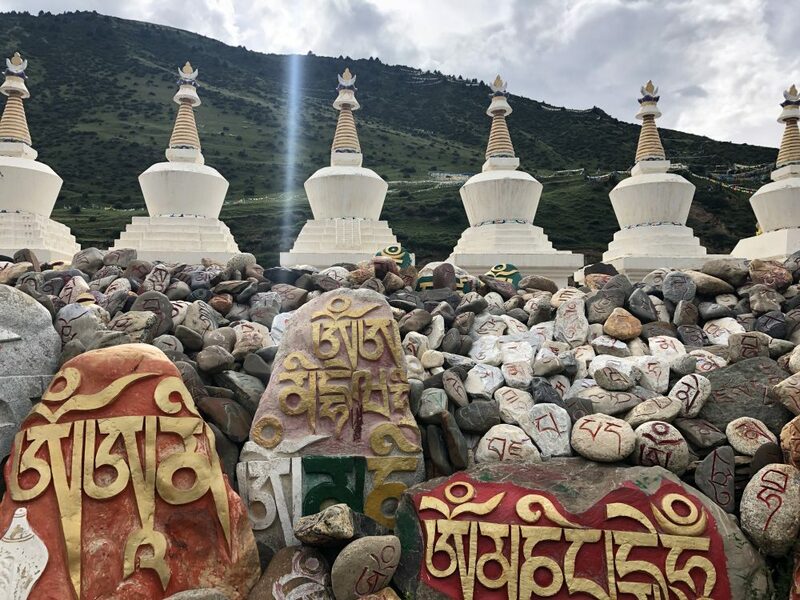 In 1857 Chogyur Lingpa’s termarevealed the names of numerous sacred sites throughout Kham and Amdo that were blessed by Padmasambhava and connect with the B-V-M-Q-A of enlightened wisdom. Kham was finally confirmed as a place for sacred pilgrimage. Once we passed the border town Dartsedo, famous for its tea trade (and the lovely Dorje Drak Monastery), the land came alive with stupas, gilded temple domes, prayer flags and mantra carvings dotting the hillsides, rocky cliffs, river stones, etc., all inevitably serving as protective forces and a clear reminder that the power of the Buddha dharma is alive and well in Tibet. 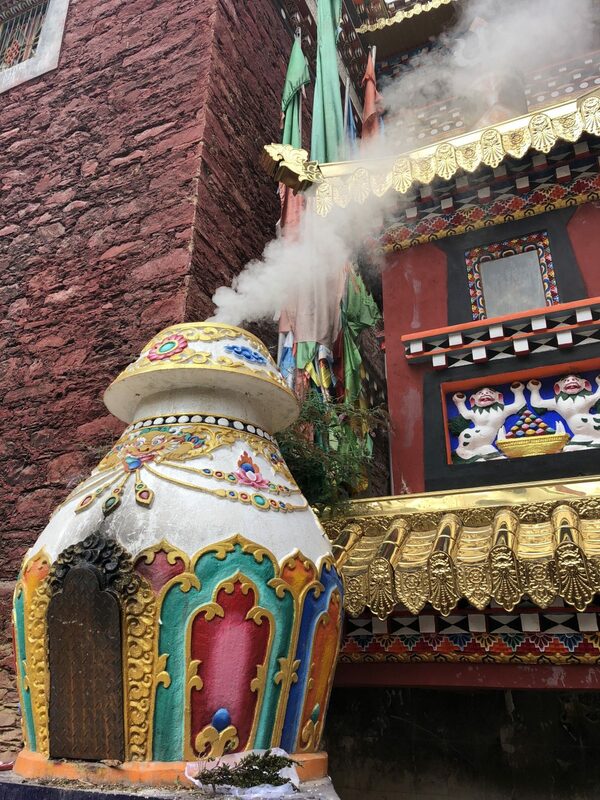 Not only that, the land became rich with the colorful and beautiful decorative arts of Tibetan village structures. We proceeded at a fast pace, but from Bamei to Tawu and Kandze we passed through rich green rolling hills with grazing yaks and swift rivers, farmlands, high peaks and many mountain passes. I delighted in the varied features of each region and the magnificent skies of ever-shifting white cumulous clouds against a brilliant blue expanse. In a flash the skies can turn into churning dark and ominous clouds only to revert quickly back to clear blue skies. The power of the raw elements of nature is the most intense I have experienced anywhere. And it was summer. I can’t imagine the harshness of winter! From Kandze we gained altitude rapidly passing through more rural scenery and entering the heartland of Kham, where many famous masters lived and practiced going all the way back to Dusum Khyenpa, the first Karmapa (12th c.). We stopped at the beautiful glacial lake of Yilhun Lhatso (where Kalu Rinpoche meditated as a wandering yogi in caves below the highest peaks topping 6000 m). Later, above the old dusty village of Dzogchen (4020 m), we had a picnic by the famous monastery and hiked to the retreat hut where Patrul Rinpoche wrote “Words of My Perfect Teacher”. 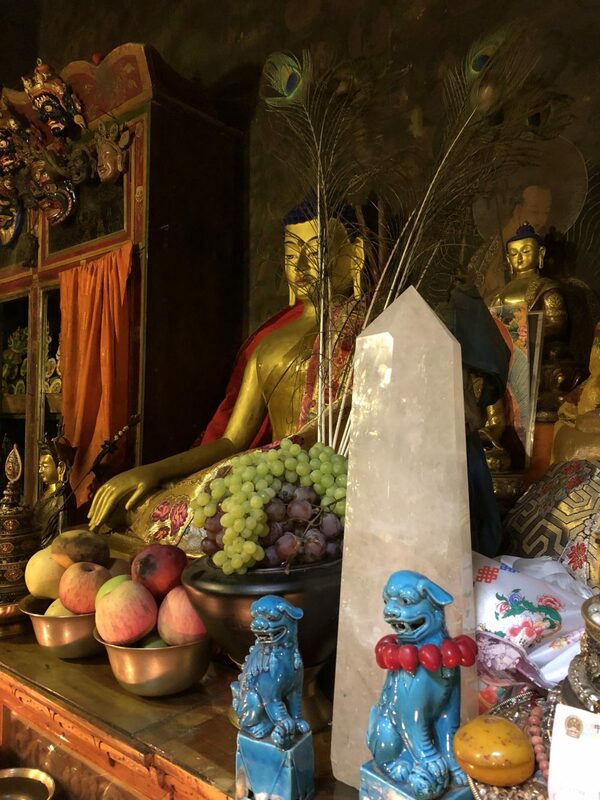 We also visited a crazy yogi and took a side trip to Zechen monastery where we met the friendly Khenpo Gyaltsen in his home, were kindly served Tibetan tea and snacks, and were spontaneously offered an empowerment of Vajrakilaya and Hayagriva. Marvelous!! On to Galenting, then Derge, the cultural center of the region and home to the ancient lineage of kings. We explored the magnificent buildings of Parkhang Printing Press. Here thousands of woodblocks from all traditions are reverently stored and printed daily by hand in the way it has been done since its founding in 1729 by royal patrons. We also viewed Derge Gonchen where our master Chögyal Namkhai Norbu, was trained at the young age of eight. At a charming small temple of Thangtong Gyalpo in the old Tibetan section we circumambulated with local Khampas and viewed a lovely clay statue of his image inside. Later, at Pelyul monastery, set high in a Swiss alpine-like valley, some of us meditated in a small temple housing the relics of tertonMingyur Dorje. At Adzom Gar, rare original murals survive because the Gar was used to store ammunition during the cultural revolution. My daughter Leah sensed the presence of many spirits here. On to Yarchen Monastery where we witnessed by chance a “sky burial”! Huge and voracious vultures descended en-masse for their meal. This is a monastic complex where large-scale demolitions took place in 2017 to control the sprawling and restless population of nuns and monks. Up to 15,000 were reputed to live here. We were closely monitored at a Chinese security “checkpoint”, a surprisingly frequent occurrence on our journey. Nyarong was truly the highlight of the journey for me. It is a land of deep gorges, with unruly rivers churning at the base of steep narrow valleys covered in dense evergreen forests. There is a sense of wildness here at the mercy of the elements. A heavy rainstorm easily causes landslides. Fortunately we were blessed by good weather. This is the land of Nyala Pema Dudul (and the land of a fierce Khampa uprising in the 19th c declaring independence from greater Tibet). We spent one entire day trying to find the isolated Lhanglhangdrak Mountain where Nyala Pema Dudul spent nine years in retreat and discovered many termas, including one of chudlen, which he practiced himself. During the last three years, he is said to have lived on wild rhubarb flowers and water dripping into his cave or sucked from pebbles. In an extraordinary vision following the retreat, he witnessed a thousand Buddhas and an infinite array of enlightened beings in rainbow-like thigles. He vowed to build Kalzang Monastery where the vision manifested. Our bus finally arrived there at 5pm after a treacherous journey traversing switchbacks on a narrow dirt road climbing higher and higher until we finally reached the base of the dramatic mountain rising like shooting flames above the tree line. Two lamas sitting outside the Gönpa were delighted to welcome us! We were shown the many precious treasures hidden and preserved during the cultural revolution, and we did a short thun. It seems there are so many special adventures with our amazing group that there is no more space to describe them all. It was a delight to share cell-phone photos with the cheerful Khampas. We saw almost no other Westerners. We adapted to daily routines of pee-stops wherever (yes, I stepped in a yak pie and squatted on a stinging nettles plant! Ouch! ), consumed electrolytes and numerous if-y Chinese snack packs along with coca-cola (settles the stomach after greasy spicy Chinese meals.) Only a few times did we get truly yummy Tibetan food. This unforgettable journey ended far too quickly and the friendships made have truly enriched all our lives. Viva Kham!